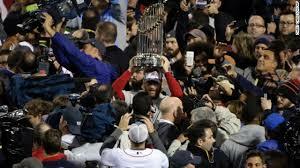 On Wednesday night the Boston Red Sox won their third World Championship in the last ten seasons. What made this achievement so remarkable was the journey that the team and its player took over the last 26 months. The road to this unlikely World Series title began in September of 2011 when the Red Sox finished that season losing 18 of its last 24 games – erasing a 9-game lead in the wildcard race and missing the playoffs by losing their last game. The coach was fired and the general manager moved on before the 2012 season, which saw the Red Sox flounder to a 69-93 season and, in the process trade away a great deal of talent. Then came 2013, when a gang of free agents and rookies came in and complemented the remnants of the gang know for “chicken and beer” – the cliché used to explain the 2011 collapse. Another new coach was hired and expectations were, rightfully so, low. The only thing was that the Red Sox began to win – single run games, extra inning games, come-from-behind games, pitchers duels and slugfests – and win consistently. They earned the best record in the major leagues and home-field advantage throughout the playoffs (thanks in no small part to the closer Sox fans love to hate, Mariano Rivera). They beat the Tampa Bay Rays, the Detroit Tigers and (on Wednesday) the St. Louis Cardinals to become World Champions. There are times when we need to ‘forget’ the past and focus on the present. In the case of the Red Sox, this is perhaps best demonstrated by the play of one player – John Lackey. He came to the Red Sox on 2010 and had a decent season, only to suffer injury and pitch poorly in 2011. It was so bad that he was rumored to have been drinking beer and eating fried chicken in the clubhouse during games that he wasn’t pitching. After missing the entire season in 2012 due to surgery, Lackey came back and pitched admirably during the past season and exceptionally during the playoffs. He even pitched the clinching game on Wednesday night. Perhaps there are critical people surrounding you, reminding you of all the mistakes you’ve made and all the ways you’ve disappointed. Perhaps there are expectations you or others established that you’ve been unable to reach in the past. Perhaps your path has been marked by failure at every turn. As the author of Hebrews recommends, at those times remember the Old Testament pillars of faith, men and women who were not perfect (and some who were far from it) but men and women who God used. He knows our past history and our present hurdles and, just as He did in days of old, He is calling us to keep running the course He’s designed for us. When we heave our hindrances and slip free of the entangling sin all about us, we can reach the places He’s created us to see. Just ask the 2013 World Champion Boston Red Sox.